Land Management Group performs groundwater modeling for the purpose of hydrogeologic mounding analyses for small and large scale wastewater disposal sites (surface and subsurface applications), stormwater systems and wetland hydrology using programs such as ModFlow, DrainMod, & Colorado State mounding analysis. 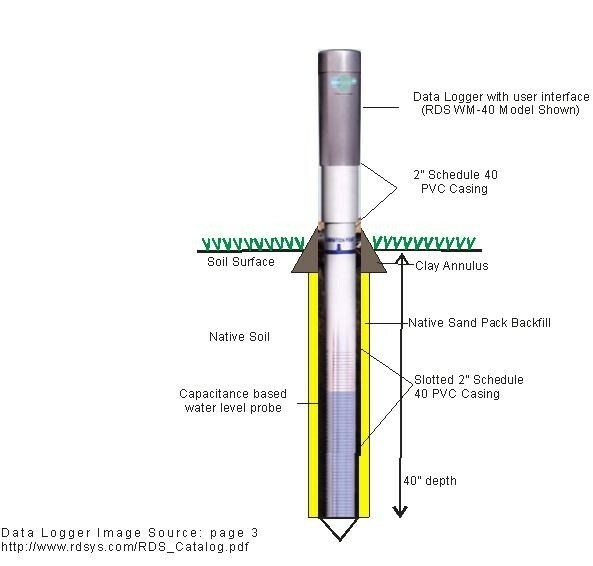 These analyses also utilize Remote Data Systems (RDS) automated shallow groundwater level recording instruments. As part of LMGs wetland determination, the use of automated wells by RDS are used to verify the presence or absence of wetland hydrology on altered sites relating to U.S. Army Corps of Engineers jurisdiction or wetland mitigation success criteria, rainfall analyses are also performed to quantify the normal periods of precipitation. RDS instrument users can download and e-mail their water level data to LMG for a graphical presentation and analysis relating to wetland jurisdiction as well as issues with seasonal high water tables for septic system permitting and stormwater evaluations. LMG routinely conducts surface water and groundwater sampling to characterize ambient biological and physiochemical parameters. LMG is capable of in situ water analyses utilizing protocols established by State Agencies and scientific literature. Water samples requiring further laboratory analyses are contracted with a State certified laboratory using EPA and APHA techniques.Individual site assessments have been used to help identify potential contaminants from point and non-point source discharge as well as aiding in the determination of SA waters for stormwater regulations. LMG has been involved in a variety of water quality monitoring projects including long term water quality assessment of innovative stormwater treatment design and dissolved oxygen modeling for marina feasibility analysis. Water quality studies at LMG are site specific according to the needs and goals of each project. There is currently a high demand for quality fill sand at construction sites and road improvement projects. LMG has routinely helped clients locate tracts of land or investigate their personal property for deposits of quality fill sand. LMG performs sediment borings at sites to determine the quality of the sand and collaborates with an engineer to determine the quantity of sand deposits to help determine the economic value of the sand. If a sand deposit is economically feasible, LMG works with an engineer to obtain a mining permit through NC DENR Land Quality Section. Our geologist can evaluate your property for sand and fill deposits and schedule the drilling equipment and laboratory analysis of the sediments. Our staff can also calculate dewatering setbacks from wetlands based on drainage models used in our office. Wetlands are defined, in part by the depth to the shallow water table. These systems are dynamic and are frequently referred to in the regulations. Accurate identification requires them to be monitored daily to fully represent depth-to-water fluctuations. Shallow water level monitoring devices capture daily depth-to water table readings (see first figure below) and are capable of recording measurement intervals ranging from once per minute to once per day. Using guidance from the US Army Corps of Engineers (USACOE) technical guidelines our staff download the data loggers from the well and graph the results. Daily rainfall is measured by an onsite rain gauge. Water level data, rainfall data and historic rainfall norms are plotted graphically (see second figure below). When the historical percentiles are compared against the daily rainfall, a context of normal rainfall is established. 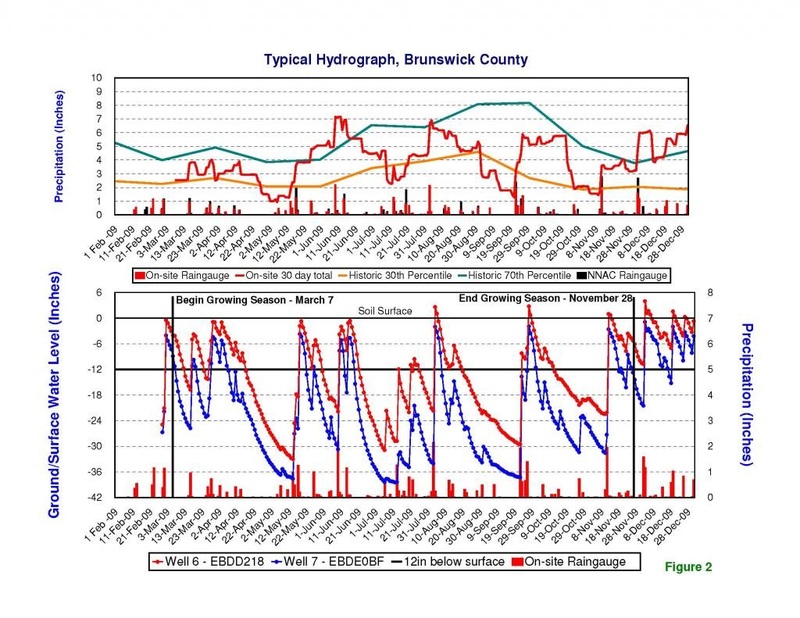 During the normal periods, well data is relied upon heavily and considered to have the greatest significance of the three wetland parameters by regulatory agencies such as the USACOE and the state and local agencies. This data is then utilized to determine if there are any wetlands within the study area. Graphed well data is also used to manage our wetland mitigation sites.